This script allows you to determine an actor’s attack skill based on different properties such as the actor’s equips, currently applied states, class, or the actor itself. You can dynamically change the attack skill during battle by simply changing one of these properties. 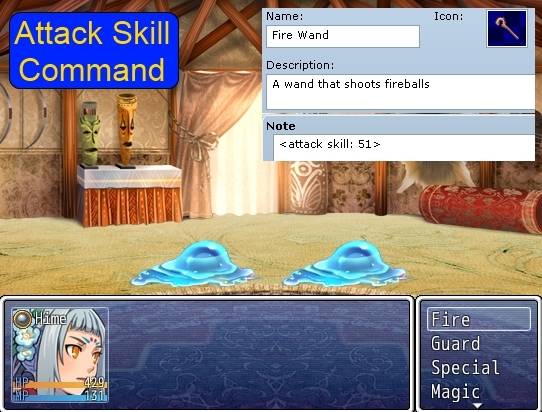 By default, the attack command executes the “attack” skill, which is skill 1 in the skills database. attack skill ID’s have equal priority, then whichever appears first is taken. 1 if no custom attack skills are defined. I’m currently also using other scripts, includig Yanfly’s extra equip slots, and have the command manager for this above this one. Try disabling the other scripts and see if it still occurs. Script ‘Attack Skill’ line 179: NameError occurred. By the way, the error occurs every time i launch my game. Do you have the command manager installed and placed above this script? Hello. Having a bit of an issue getting this to work. What is the “Commands” script? What is on line 808? question: how do you write a formula using s? does it go by s(n) = true? or would s(n) or s[n] would suffice? i tried s(n) and s[n] on it’s own and it didn’t work. What is “s”? Do you mean the switches? You would write s to refer to switch 1. Hi hime, i’m refering to the attack skill command, just not really sure how i should go about using a formula for it. i’m basically changing the default attack skill to skill id 171 ( where i have the actor learn it via a battle event). what i’m doing now is activating this change via switches, like s for skill id 171 for example. do you have some pointers on how i can write it with this tag? perhaps? hope i’m making sense.